The Sarasota Police Department is investigating an apparent drowning that occurred in Sarasota Bay at approximately 12:15 p.m. on July 4, the department announced. 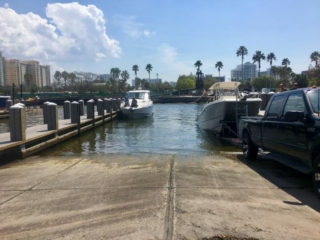 Officers responded to the area of Centennial Park and the 10th Street Boat Ramp after receiving a call about two swimmers in distress, a Police Department news release said. When the officers arrived on the scene, they learned that two adult males had been swimming for an unknown amount of time, the release added. The men became separated in the water; then, a short time later, one man found the other unconscious, the release continued. After the conscious man had been treading water for a while, the release said, someone in a passing boat spotted the two men and called 911. The Sarasota Police Marine Patrol found the men, but only one of them was alive, the release added. The age of the deceased male was approximately mid-50s, the release noted. Detectives with the Criminal Investigation Division took over the investigation, the release pointed out, but they said the incident appeared to be accidental; no foul play is suspected. Genevieve Judge, the public information officer for the Police Department, told The Sarasota News Leaderon the morning of July 5 that detectives still had not released the name of the deceased or any other details about the incident. She added that she did not believe the detectives had been able to notify the next of kin.